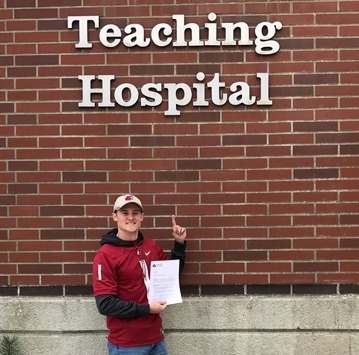 Thomas has been accepted to Vet school! This kid shared his dream with us nine years ago, on his first visit to Washington State University. 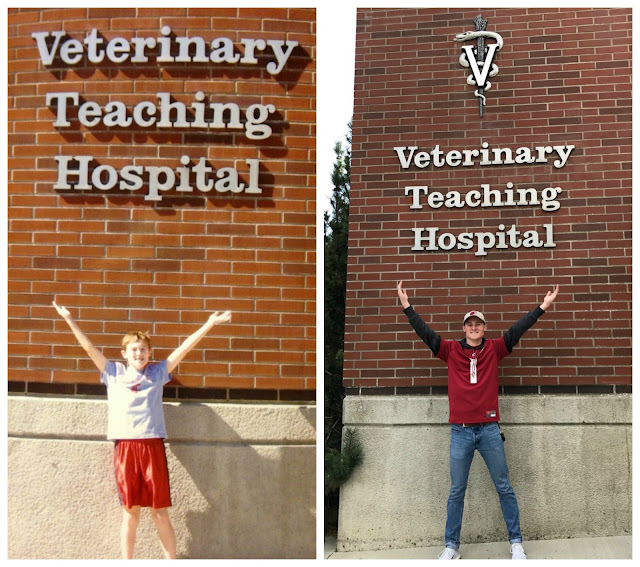 He asked me to take a picture of him under the Vet Hospital sign, and told us he would study there someday. He was going to be an animal doctor. He's always loved creatures great and small, and I thought he was cute, but did I really think it would happen? I can't say for sure, but I'm guessing probably not. How many of us end up doing what we dream about at ten? I don't remember what I wanted to be at that age. Although it might have been mom-hood, and that worked out pretty well. The last few years have been tough. Mostly for him, but we've been along for the ride. A challenging high school course load, in order to be accepted to the Honors College at WSU. Difficult college classes, vet job shadowing, animal volunteer work. Writing and rewriting the application and personal statement. The interview, full of moral and ethical questions I wouldn't have been able to answer. And then the wait. He drove home five hours to tell us in person... I made it. I cried happy tears, full of excitement, and relief, but most of all pride. Heart bursting pride in both of my boys. I wrote about Conner's dream years ago, and he's continued to follow his passion, becoming the youngest Master Technician for Toyota in the state. The path might be rocky and difficult, uphill and exhausting, full of doubt. All these years I thought I was leading my boys, but maybe they were teaching me. Our dreams can come true, if we have the courage to pursue them. 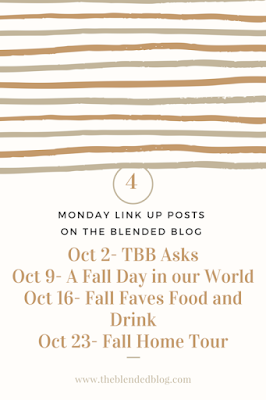 Be sure to stop by The Blended Blog today where some of the ladies are sharing a day in the life. 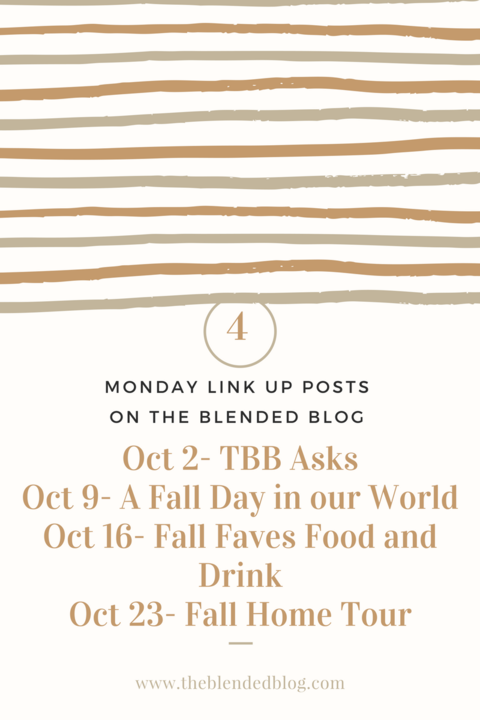 I love peeking at what everyone else does with their day - it'll be fun! I am not only overjoyed for Thomas, but I am overjoyed for your whole family because I know how much this means to you all! It is truly a special thing To see your kids dreams coming true! We're the happiest when they're happy, right?! How wonderful! Congratulations to Thomas! My niece also has hopes of possibly becoming a vet. What a fantastic job. I wish the very best for him. Congratulations to Thomas! What an incredible achievement! Congratulations, how wonderful! All the best to him and your family and to you all I say, well done! I just love those side by side photos. Wow, he's held onto that dream for a long time! This is such great news, I am so happy for you both! I can't wait to add a third one when he graduates. Thanks Carrie! Oh my gosh I have tears in my eyes. 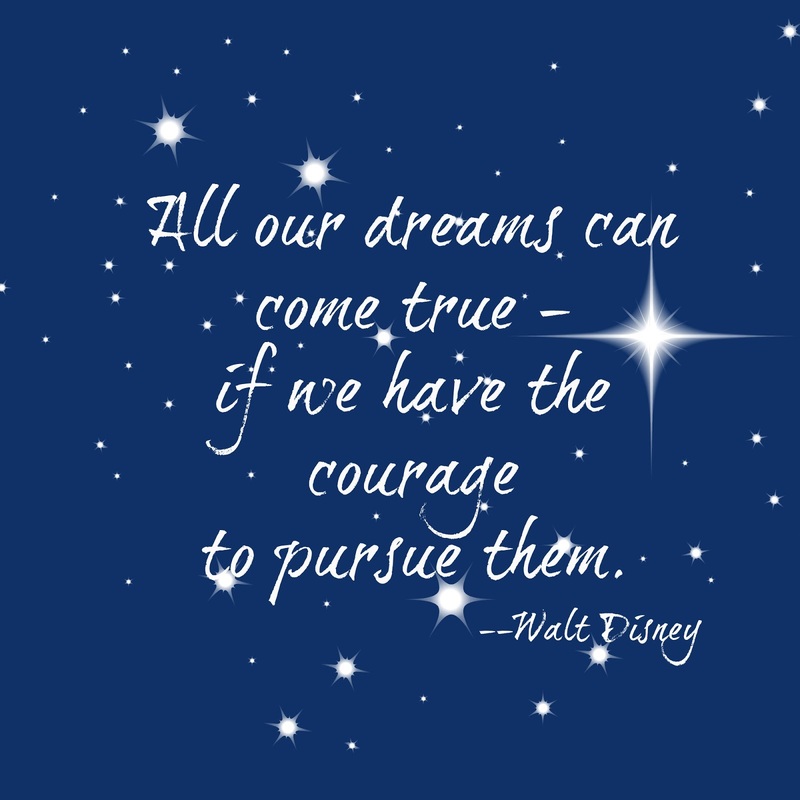 Your pride, hopes, dreams all come through so deeply through these words. Congratulations to him and your whole family. Best news ever. Aw, you're so sweet. Thank you so much! WOW!!!! That is an AWESOME accomplishment - vet school is SO HARD to get into!!! I am thrilled for you and Thomas. It's so nice to see dreams, hard work, and perseverance pay off! God bless you all! He has worked so hard and we couldn't be happier. Our vet's best friend is a neurologist because he couldn't get into vet school - there aren't very many of them. Thank you! I am so happy for him. He is going to be doing such a beautiful thing. Anyone that can love and care for animals is awesome. Now I will have a vet to recommend to our friends who end up stationed in the pacific Northwest! Oh yay! He has always loved animals, even as a little boy. Awesome news!! I know you are one very happy Mama!! So happy! And I know you know what it's like when they achieve their dream. Thank you Laura! What awesome sons you are raising! Haha - I'm taking a little bit of credit! Yay! I am so proud of him for sticking to it, so freakin' awesome! This is so super wonderful! How sweet that he drove home to tell you in person but of course he did! And of course you cried! Such a sweet and encouraging post. Thanks Carrie. We knew he was coming home, but didn't know he had such good news to bring! Aww! I LOVE that he drove five hours to tell you. That warms my heart. My oldest daughter always knew she wanted to be a graphic art designer when she about 12-13 ... she had plans to do it in New York City but ended up in Wisconsin with her hubby... she did become a graphic art designer.